In response to calls for raising higher education graduation rates, the latest data from the U.S. Department of Education indicate that certain sectors are, in fact, showing some signs of improvement. The rates shown here are for full-time, first-time, degree/certificate-seeking undergraduate students in specific cohort years who finished by August 31, 2012 (150 percent of normal program completion time) at the same institution where the students started. Four-year institutions used 2006 as the cohort year, while two-year institutions used 2009 as the cohort year. As noted above, IPEDS doesn’t track completion rates for less-than-full-time students or for transferring or returning/interrupted-attendance students, e.g., it excludes students who didn’t graduate from the community college they started at but who may have transferred to a four-year college. Source: IPEDS, U.S. Department of Education National Center for Education Statistics, 2007-2012 reports, Enrollment in Postsecondary Education. 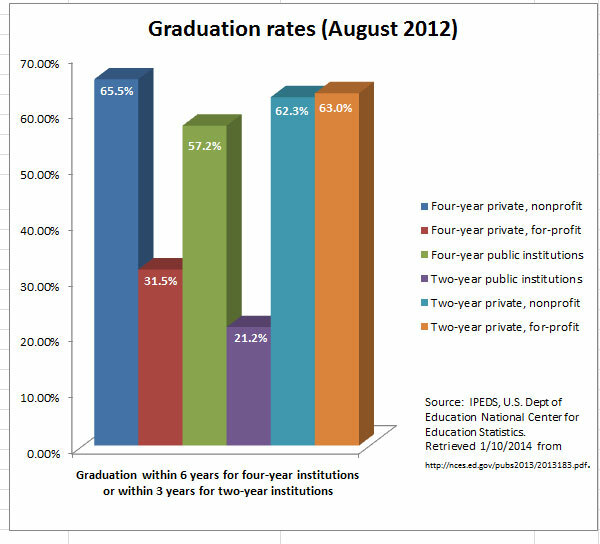 3.0 percentage point gain for for-profit, two-year private colleges, from 60.0 percent in 2007 to 63.0 percent in 2012. In contrast, graduation rates appear to have changed very little for nonprofit four-year private institutions and for two-year public institutions. What are other campuses doing to improve college student retention and completion rates? If you would like to learn how other campuses are making improvements in retaining their students, please join us for an upcoming webinar, Raising Retention Rates by Prioritizing Student Interventions on Wednesday, March 5, 2014, at 2:00 p.m. Eastern Time. This webinar will feature case studies from two campuses.